It's difficult to communicate what really happens to people's data when engaging with third party services. Clear visuals that explain data transfer are an effective tool to educate people. Onecub is a real startup who's created a service that acts as an 'agent of your personal data.' OneCub allows people to safely view, edit and share data, gathered from their personal email inbox, with companies, websites or third parties when explicitly requested. People can always view, add and control their data at any time and decide who has access to it. The Onecub interface does not currently allow full deletion or transfer of information in accordance to upcoming GDPR portability rules but it can be done manually. Trust is key to algorithms-based businesses. People tend to be reluctant to give robots full access to their personal data and for many, the idea itself simply unnerves them. Enabling people to customise and build their own privacy policies could help to solve some of these issues by helping people make informed decisions and have meaningful interactions between themselves and their data. The cross-functional Design Jam team took on the challenge and focused on describing the interaction where Onecub inserts itself between a third party service, in this case a recipe app called Umanlife, and the person. Building trust is crucial for a service that relies on access to people's emails. To do so, Onecub takes an educational approach to provide more transparency. 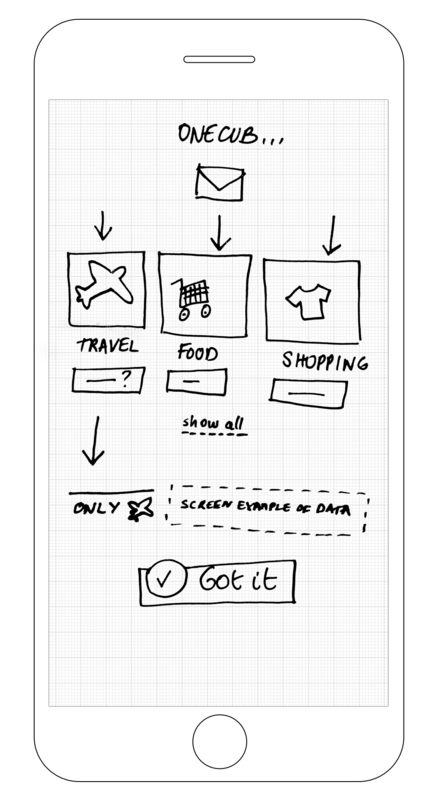 The app uses clear language to explain how people's data is processed and what controls they have over it. Data sharing options are displayed with equal importance so as not to bias people towards one choice over another. 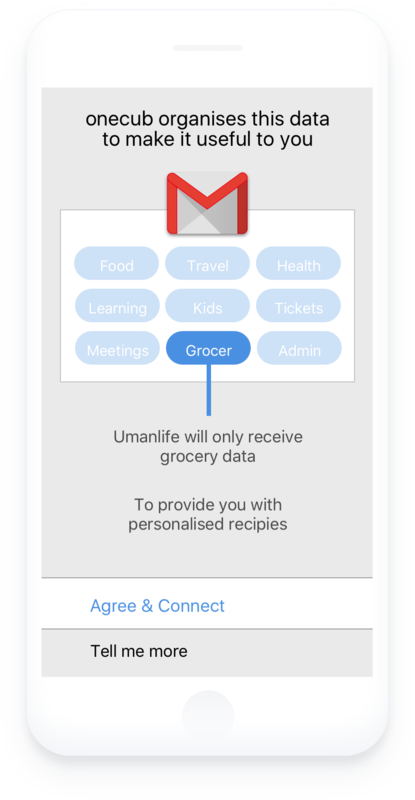 When people want to use a personalised service – such as umanlife, a custom recipes app, Onecub sorts the mails metadata to provide the app with safe and specific data only: in this case data related to food. Several OneCub founders came to the Design Jam because they wanted to develop new solutions to be as transparent as possible in depicting their data use and role within a transfer between user and third party service. Additionally, they hoped to create solutions that might educate people not to be afraid of their digital data and instead understand it’s power if it’s well organized and securely transfered to the right services. This is a lot of information to be expressed in a single screen! We're excited to hear that Onecub also plans on recruiting a User Experience designer in the coming months to help continue the conversation on how designers can innovate for privacy.